Case studies, social and economic aspects of wind energy in developing countries. registration fee should be made either by credit card (Euro, Master or Visa), or by bank transfer. to the sessions, coffee/refreshment and lunch/dinner. PS: please stop laughing at the logo. My explanation, a lion was standing near a wind turbine, it farted a lightbulb or had a brilliant idea. groups, give them my contact details below. to provide proof of students registration to get it to our account. I will appreciate your assistance. Usual disclaimer: I am just passing the information along, please do your own due diligence when contacting the person. Update: The Acumen fund fellowship program is accepting applications, the deadline for that is October 20th 2008. For more info, click here. Well, when I started blogging I never thought a video of me talking at a panel was part of the deal, its quite strange watching yourself and getting self conscious about the whole thing. OMG mom! I am on the equivalent of TV! Lame lines aside; Erik has the video, I cant get myself to embed the video on my blog yet. I feel like Mike, that i could have done more. Some of the things I mentioned might seem a bit esoteric, so i will add some links and mention a few things i think i should have included at the panel. I was listening to the digital planet podcast (11/26) where they had a correspondent attend the launch of the OLPC in Abuja, Nigeria. You could hear the excitement and enthusiasm in the children’s voices as they spoke of what they would do with the OLPC. It was a great moment. Now to the questions that started popping into my head like Orville Redenbachers microwave popcorn. When Gareth Mitchell was talking to Bill Thompson, they mentioned how they attended the OLPC launch in Tunis and how a child was crying because they’d been given an OLPC to play with for a time, then it was taken away. That was not a good moment, rather sad really, that kid is probably traumatized right now wherever he or she may be. I mean isn’t that just a little cruel? I know i would wail like a banshee if i was in her shoes. The discussion segued into what it would mean for the children to have a laptop that they would call their own. This got me wondering, that perhaps one of the unintended consequences of the OLPC project is that it would enhance the idea of ‘mine’ rather than ‘ours’. In modern Africa do the age old African values of community and sharing still apply? Would the OLPC idea chip away at the ‘utu’, that is a societal benchmark? Is the Ndiyo project a better thought out model for computer literacy, what with the idea of USB thin clients that I am already a fan of? I should add that I think the Ndiyo model of networked computing could be well suited for school situations. This is because of two reasons. 1. Cost – The class sizes in Kenya increased owing to the free primary schooling offered by the government. Having a networked model enables more students to get basic computer literacy, as they can share the computer lab resources. This is particularly apt i think because the OLPC project was geared towards schools in the developing world. 2. This i already mentioned above…the idea of ‘my laptop’. The OLPC can be shared between students…but if you have a class of 30 children and 28 OLPC’s someone will undoubtedly get disappointed.On the other hand, as Steve mentioned in the post on OLPC Keyboard..i will reiterate his comment here, because i think its very important. Some thoughts: you ask “Maybe I am looking at this all wrong, Is Negroponte pimping the â? ?education projectâ?? in pursuit ofâ?¦what?”. Well, maybe the answer is indeed in plain sight. Maybe he just wants to provide technology access to the masses like he keeps telling us he wants to. And here is another thought for you: if the OLPC team did indeed go to Nigeria to look for inspiration for the design of the product, it is heartening that they are looking to the populations that will actually use these products for design and usability clues instead of sitting in Boston or LA or wherever and saying “hey, thats what the kids/world/users/consumers need”. I have in the last month or so found myself increasingly frustrated with this attitude to design and product creation when I have to “fix” my computer for my 4 year old who wants to use it but cannot understand why in the world Windows keeps doing stuff and getting in his way. Find out what your users need and want and give it to them. End of story. Though i haven’t had a chance to play with the OLPC, I am sure its a fine product. From Steve’s comment i think the OLPC should just be marketed as a low cost computer for those interested to buy for their children/themselves, and not specifically geared towards governments purchasing them for schools. The Give one Get one campaign was nice…but how were the ‘given’ laptops distributed? What rationale? I don’t mean to sound ungrateful, but I think that at a price like $100 how about seeing some free-market action going on in Africa? That is a whole other AID Vs TRADE debate right there. On the power to charge OLPC: There is a larger question of power in Africa, which i won’t get into right now (though i will in the coming weeks) For a glimpse of the opportunity, Idris Mohammed mentioned the great opportunity in power generation during last years’ TEDGlobal. More here, and whenever his talk is posted, it will be on the TED site here. Erik did mention that there is a cranking device that can be used to power the OLPC, and browsing the power supply tab on OLPC news shows some novel and innovative approaches to solving the power problem. 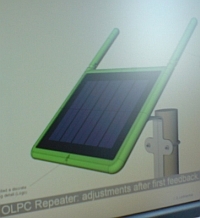 From a cow dynamo to something i like…the OLPC solar mesh repeater. Mobile Phone Tech: I think between Mike, and Erik we covered this o.k. A sim card/chip costs less than a dollar…and the phone with a flashlight that I was referring to in the video looks like this. On cell phone reach, here is one example of celtel’s reach illustrated in a post from a Zambian economist. My little screed last year about the iphone hints at the fact that i totally love the fact that you can choose whichever carrier you like when in Kenya/most parts of Africa. Its just a matter of switching sim cards and not having to worry about whether your phone will work or not. Most if not all the handsets in Kenya are unlocked. The best results are achieved when you move with the natural flow of grassroots creativity. Often, this means abandoning or suppressing preconceived notions, and building on spontaneous and creative adaptations of the new technology by local people to meet their needs. One more link…Guy Lundy’s ‘Future Fit’ – An African futurist to watch. I am honored to have been part of the Africa Panel at DEMO 08 which happened yesterday. Erik and Mike did an awesome job of blogging about the sessions. My sincere thanks to Chris Shipley and Erica Lee for having us. There were so many interesting exhibitors, you can explore a full list and find more information about the cool stuff that launched. I will highlight just a few of the products and services that stood out for me. 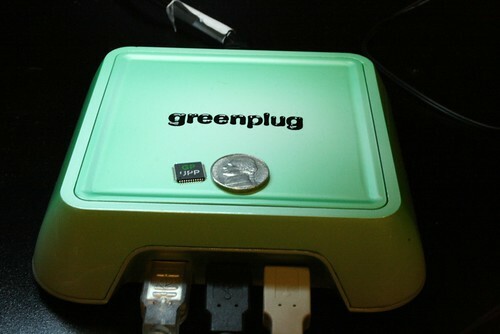 The first one is Green Plug – A charger that can be used for multiple devices. Their tag line is “One plug, one planet”. Think of the many chargers you have to carry with you, and when you abandon a device, that charger ends up in a landfill somewhere. The Green plug eliminates the need to carry multiple chargers. The small chip pictured here makes it all happen. …Using a breakthrough technique for transporting packets over multiple network paths, it enables delivery of real-time content consistently and at a high quality over the Internet. It is geared towards ISP’s and larger content delivery companies, but from their demo it seems their products could useful for those building new networks and want higher quality video delivery than is currently being offered. I thought of the now delayed EASSYproject that would have brought fibre optic backbone to Kenya…:( and to step back to something i had written last year about building network of networks, in time, it would be great to revisit how this new technology could help in low bandwidth areas or in new network systems being implemented in Africa. On Celsias, you can read a widely-recognized climate change blog, review practical projects from all over the world and meet the coolest people who share your passion for stopping human-induced global warming. If you want to roll up your sleeves and get your hands dirty, register on the site, create a project, then recruit people or funding to get your project off the ground. I think i may have taken too many pics, you can browse through them on this flickr set. There is lots happening in the Renewable energy (RE) field in Africa. From various sources, here are a few hits that have crossed my virtual desk. Can you set up a 120MW wind power plant? If so, the Ethiopian Electric Power Corporation (EEPC) wants you. Interested companies can submit their proposals before Feb. 4th 2008. Please see attached PDF for the information. An exhaustive article about wind power in South Africa, click on this cool graphic. What is becoming more and more apparent is that there is a unique opportunity for the growth of a serious renewable-energy industry in South Africa, given growing security of demand and a desire to reduce the countryâ? ?s carbon footprint. But what is also plain is that unless government and Eskom take an active role in its promotion, the full potential for renewables will not be realised. The article also includes a picture of Simon Mwacharo, the owner of craftskills, TEDster, and friend of the blog. Simon Mwacharo knows one or two things about moving under the feet of the big boys and girls to be the first on the cash till. While KenGen is scheming in the boardroom on how to meet the rising demand for electricity, Mwacharo is on the ground, providing hundreds of homes with electricity generated from the wind. Mozambique University has launched a local program to encourage renewable energy self sufficiency that may become a model across the continent. From Newscientist: Solar water purifier distributed by Rotary international. Update: Cant believe i almost forgot about this video. William Kamkwamba was featured on WSJ! Here is a link to a not so flattering post about the solar charger Solio (take it with a grain of salt) I haven’t tried Solio, but mysoldius worked really well for me. So i finally bought a voltaic backpack. I was worried about traveling with it, especially when going through airport security. The screeners were fascinated about it, asking lots of questions. Joel Johnson of BoingBoing gadgets had mentioned that he had no problems traveling with it – My experience was the same. No issues at all, actually its a great conversation starter. Initial envy from the geeks at my friend’s office in Kenya – Very High! The video by Ben Craft shows a small hydro power plant that generates electricity for a community near Chuka. As noted in the video, power generation of this kind helps with the Infrastructure problem we have in Kenya, particularly in rural areas. Lighting Africa (LA) is a joint World Bank (IBRD) and International Finance Corporation (IFC) initiative aimed at developing the market for off-grid lighting in Africa and providing poor households and small businesses with access to modern, clean and affordable lighting products. The grant competition is open to a variety of organizations, from entrepreneurs, LED suppliers and NGO’s. Click here for more information about the grant competition and here for the forum where you can ask questions about the grants process; It is also a B2B portal of sorts. A ’10 questions’ interview of Steve ‘Ntwiga’ and Afrigadget team at the Sietch. Africa from a business and entrepreneur point of view. Last but not least, check out the 5 dollar solar thermal water heater from Instructables (Requires modification). AOB – Agony is: finding your web host’s site has been hacked into. 🙁 so if the blog is not reachable, i have a backup, i am keeping my fingers crossed that it gets sorted soon. … providing financial support, capacity building and technical assistance to energy SMEs in developing countries. Using funding from the Russian Government, GVEP intends to set up two Regional Funds in West and East Africa to build local energy supply chains and grow economic development from the bottom up. “The Greek Orthodox Church in Cyprus has announced plans to invest $234m (Â£115m) in solar energy. Archbishop Chrysostomos II said the church would build a factory that would make photo-voltaic panels to capture the sun’s energy.” – Now that is a faith based initiative i could get behind. Fun from The Daily show with Jon Stewart: An awesome lampoon of the Cape Wind project in Nantucket. Big wigs don’t want it because it will presumably ruin their long range view from their mansions. Clean Drinking Water Pumped by Wind Energy! This installation in Chifiri, in North Eastern province Kenya is an example of how wind and solar installations can be used to provide the needs of marginalized communities in arid and semi-arid areas. Simon Mwacharo, TEDGlobal speaker and renewable energy innovator has written about it in wonderful detail and provided pictures. Read more about it here. The turbine also provides some power to the nearby manyattas (traditional samburu huts), Simon noticed a Japanese guy camped out near the turbine. That was the only place he could charge his laptop and phone! Do note that next week, the TEDGlobal talks will premiere on Ted.com. Subscribe in itunes by searching for tedtalks and also check the TED blog for a series of posts from bloggers who attended the conference. A piece i wrote is is alread posted on the TED blog, Like Emily said ‘This is the bloggers story to tell’, because there wasn’t as much coverage of it in the mainstream news. I hope you enjoy the talks.